Through the Lunar Dragon Privy Mark 1oz silver coin issued in 2012 the Perth Mint added another exquisite item to the wonderful collection built with the help of this animal from the Chinese zodiac. The Lunar Dragon was also minted in gold, however without the privy mark. The Lunar Dragon Privy Mark 1oz silver coin amounts all the characteristics with which the Australian Perth Mint has accustomed collectors and investors from all over the world. It has a high purity of 99.90% silver therefore it is made of pure silver and weighs 31.10 grams or one troy ounce of silver. The Chinese Dragon is a highly used character on the tail side of the coins belonging to the Lunar series so we could talk of an extension of this Lunar series, which comprises all the twelve characters from the Chinese calendar, an extension entitled the Lunar Dragon series. Except the Lunar Dragon Privy Mark 1oz silver coin there are numerous denominations that do not include the privy mark, as follows: 1oz, 1/2oz, 1oz, 2oz, 5oz, and 1 kilo. So investors have an entire world of possibilities form which to choose. The design for the Lunar Dragon Privy Mark 1oz silver coin issued in 2012 is the same as the one encountered on the other denominations belonging to the Lunar Dragon bullion silver coins, to which it is added the privy mark. The privy mark is represented by a Bavarian lion small engraved inside the pearl that accompanies the Chinese dragon. This whole engraver is designed on the reverse of the Lunar Dragon Privy Mark 1oz silver coin. The Chinese graver is depicted in a fearful manner, as a creature with four legs therefore it can really be described as a mythical design. 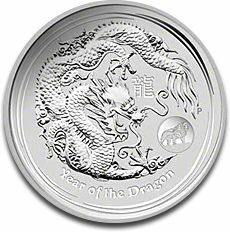 Also on the reverse of the Lunar Dragon Privy Mark 1oz silver coin is inscribed Year of the Dragon also written in Chinese characters, which is the year 2012 in which this coin was minted. The obverse of the Lunar Dragon Privy Mark 1oz silver coin belongs to the pattern established by the Perth Mint. It is therefore a depiction of the right facing portrait of Queen Elizabeth II. The legend is present in a circle: ELIZABETH II, AUSTRALIA, 1 DOLLAR denomination, 2012 minting year, and 1oz 999 SILVER. There are two important factors that should be taken into consideration when deciding whether to invest or not in the Lunar Dragon Privy Mark 1oz silver coin that was issued in 2012. The first one is related to the price of this coin which is smaller than the one for the Lunar Dragon 1oz silver coin without the Bavarian lion. The second factor for which investors should acquire the Lunar Dragon Privy Mark 1oz silver coin is that only 200,000 coins were minted. It is quite a limited mintage for a special silver bullion coin that has exquisite bullion characteristics. These factors will surely increase the value and profitability of the Lunar Dragon Privy Mark 1oz silver coin that was issued in 2012 and is present on our website.